Back at Yahoo! (YHOO), there was an unofficial rule of being able to telecommute one day a week. It was known as WFH, or Work From Home. Along with that was another acronym, OOO, or Out Of Office. Whenever someone would WFH, or be OOO, they’d send an email to their entire team. Sometimes it would include a reason. Other times, simply a “WFH” as the email subject and nothing else. 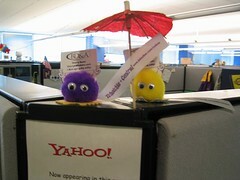 Isaac Schlueter of Foo Hack recently wrote about an awesome tradition in his team at Yahoo! – writing haiku emails. Whenever someone is going to be WFH or OOO, they’d send it in the form of haiku. Must take advantage of this. How awesome an idea is that? Wish I had thought of it! The next time you’re going to be out of the office or telecommuting (if your company allows it), consider communicating it in haiku. Why not make work fun!